If you have been thinking of using hunting leases for your next hunting trip you should spend a few minutes getting to know what they are and why they are used. If you are an old pro at this, you already know how important it is that you understand the agreement before signing it. If you are new to this, you will find some interesting tips in this article. 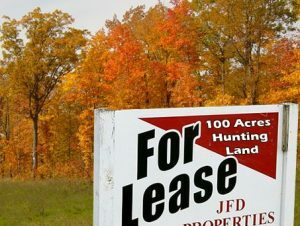 The vast majority of landowners are now using hunting leases as a way of allowing hunters onto their private lands without having to assume too much personal risk. These agreements are a way of protecting themselves and their property, and you should not be surprised if you are asked to sign one before being allowed to hunt on private lands. But what are these agreements and what should you know about them before signing one? It is important that you understand the agreement is a legal and binding contract between you and the landowner. This means understanding hunting leases and the agreements that go with them are solid and will hold up in court if problems arise and the landowner decides to suit you. You should also understand that they are flexible. All hunting land leases agreements can vary as the landowner wishes. He or she can put just about anything within reason into these agreements. This is why it is imperative that you read any hunting leases agreements that you are presented with before you sign them. You may be surprised at how many hunters simply skim over the document and then affix their signatures. You should always remember that what might have been in the agreement last year may not be there now, and conversely, what was not there last time might be present today. If you have any questions about the hunting land for lease that you are presented with, you should ask the landowner for clarification. It is important that you do this, and the more detailed the agreement the more questions you will probably have. You should keep in mind that landowners are using hunting leases and protection agreements more often now because they do not want to face lawsuits and they do not want to risk property damage that they cannot be compensated for should actual damages occur that you may be responsible for. They are also using them to avoid lawsuits should anyone in the hunting party be injured or killed. Generally, leases for hunting are reasonable and the conditions are acceptable to most hunters. Even so, you should understand that once you sign it you are essentially signing a legal contract. In many, if not most, cases the landowner may need all the members of the party to sign the document. Again, if you have any problems understanding hunting leases or parts of them, just ask the landowner to explain it to you before you sign the document.